« In the Place of Silence wins the Prize for Best New Fiction! Tonight I’ll be taking a break from book editing and will be reading as part of Old Growth Northwest’s Reading and Open Mic series at the Rendezvous Jewelbox Theater in Seattle at 7pm. 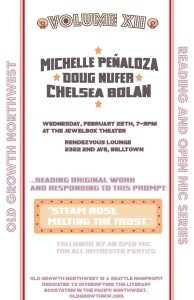 I’ll be opening up for Doug Nufer (check out his self-interview in The Believer Logger) and Michelle Peñaloza (a fellow Poetry on the Busses poet). Though the poster for the event is reminiscent of a boxing match, I won’t be fighting them. At least, if they try to fight me I won’t fight back. We’re just all going to get along instead.